What is a 'sustainable food system'? This question cannot be answered in a few words; so many issues come into play and influence each other. You only have to begin to think about your last dinner – Where was it grown? What impact did production have on soils and water supplies? Were the workers treated fairly? Who are you eating it with? It could go on and on. This Food Atlas draws together some of these issues, using stats, graphs, and maps to communicate the evidence. Our aim is to provide a visual indication of the current state of affairs, share our vision for a more equal and sustainable future, and hint at how we might get from here to there. We hope this resource is interesting no matter how geeky you are, and accessible no matter what prior knowledge you have. 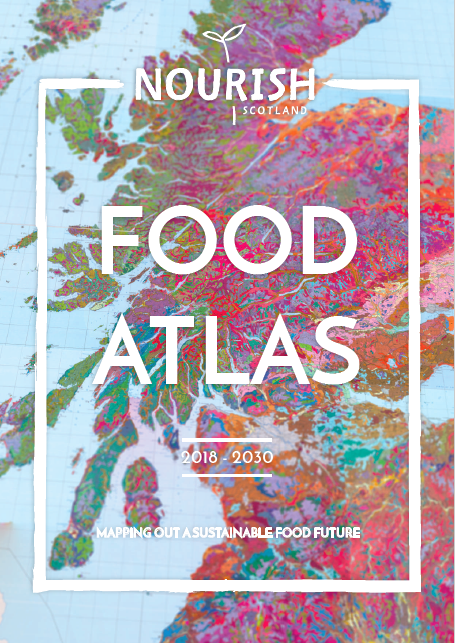 Scotland’s Food Atlas is the result of a collaboration between Nourish and the wonderful Data by Design – a graphic design start-up who communicate evidence and data in beautiful ways, for a better future, environment and society. Would you like a printed copy? Become a Nourish member today to receive one in the post!